I was completely out of control this week. There was way to much on my calendar, all pretty much my own doing. But even though I was an overextended lunatic, I managed ( I think, because I am going so fast, that I remember nothing) to make a pretty decent soup. It all really began last Saturday with the Girl Scout Cookie booth in freezing cold weather outside of Walmart. Selling cookies for four hours with 10 year old girls who constantly complain and ask to use the bathroom really wears me down. Of course, that wasn’t the only item on our agenda for the day which also included Ava and Declan going to their own basketball games, a Girl Scout ice skating event and a birthday party for one of Ava’s friends to top it all off. Sunday, Monday and Tuesday all were filled with inventory prep and scanning hundreds of pieces of merchandise at BD for me. After spending 9 hours doing that on Monday, I went directly to help Karyn with her “Cup of Life” fundraiser. After a long day of “beep, beep, beep” then wrangling 7th and 8th graders to serve hot chocolate, behave themselves, stop using their phones, etc. I was spent and still hadn’t made any part of the soup or mixed the bread dough until I got home at 9:00pm. There is more for Tuesday and Wednesday, but it’s far too exhausting to relive while writing this post, so I will leave it at that and get on with the recipe. By the way, I think it came out pretty well as I did get to enjoy it myself on Wednesday night after Ava’s Girl Scout meeting which involved 4th grade girls painting birdhouses, their clothes and getting water and paint just about everywhere except where it was intended. Bring first eight ingredients to a simmer in a large pot, keep warm. Bring 6 cups of water to a boil, add rice noodles and cook 3 minutes. Drain. Place 1/4-1/2 cup noodles in each bowl. Discard ginger from simmering broth mixture. Add chicken, lime juice and vinegar. Adjust seasonings adding more chili garlic paste to make hotter and/or soy sauce for salt. 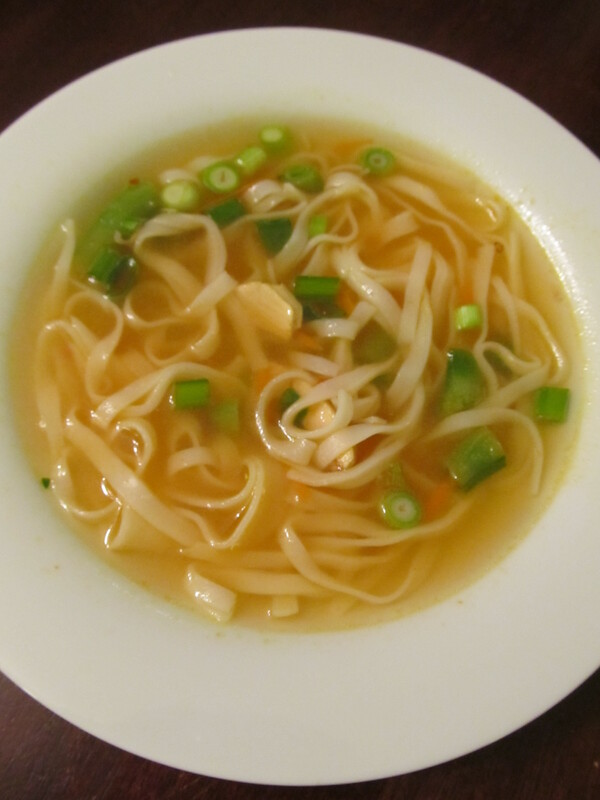 Fill noodle bowls with broth mixture and garnish with green onions as well as cilantro and mint, if desired. Serve with fresh Bread and Ginger Citrus Butter (see following recipe). Mix all ingredients together. Serve with freshly baked bread. Devour, enjoy.